The Annapurna region is a paradise of natural mystery and culturally loaded attractions. It is very much popular for trekking, hiking, and peak climbing package in Nepal trekking trip. The trekking trails in the Annapurna region lie in the Annapurna conservation area. The beautiful panoramas of the Annapurna Himalayan range are awesome and breathtaking. The trekking in the Annapurna region includes the beautiful villages of the ethnic communities, their costumes, rituals, daily lifestyles, and warm hospitality. Flora, fauna and lush vegetations are other attractions of the trekking in Annapurna region. The Annapurna region treks offer astonishing mountain views of the major mountain ranges as Mt. Annapurna I (8091m), Dhaulagiri (8167m), Fishtail (6999m), Lamjung Himal and several other snow-capped Himalayas. 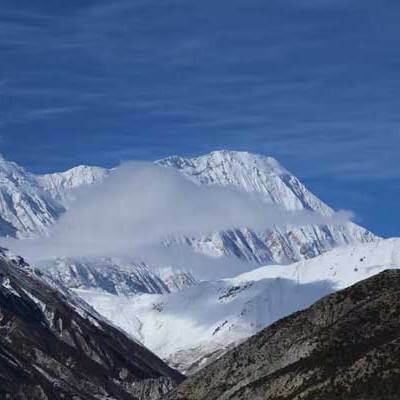 Some of the trekking trails in this region are Annapurna Base Camp trekking, Annapurna Thorung pass trekking, Ghorepani poonhill trek, Jomsom Muktinath trek, and Upper Mustang trekking. It includes the deepest gorge in the world- Kaligandaki, also a traditional trade route to Tibet, the highest Himalayan pass in the world- Thorung La (5416m), high settlement of the Manang village, Hindu and Buddhist pilgrimage place Muktinath. Upper Mustang trek includes the forbidden kingdom, surrounded by the barren land similar to the Tibetan lifestyle. It is a restricted part, which needs special trekking permit. The Annapurna Sanctuary trek is well loved trekking, which also includes beautiful ethnic settlements as Ghandruk, Ghorepani and the sunrise viewpoint- Poonhill. The region is covered with subtropical forests full of rhododendrons and other wild flowers. Enjoy the nature walk in the Annapurna conservation area. Discover the beauties of Annapurna, Annapurna South, Hiunchuli, mountain pick, MT. fishtail, and Himalayan range. Explore the ethnic culture and lifestyles. Feel the natural hot spring. Walk on the green hills, gorges and surprising landscape. 1Day 1: Drive to Nayapul, trek to New Bridge (1500 m). - Annapurna Base camp Trekking (6Ns): Best Available Lodge Accommodation during treks on twin sharing basis room. There are multiple selections in meals item in Annapurna base camp trekking. But, it can be basic and may not have choices in menu some of the rest places. - Breakfast: includes full trip. - Trekking Guide leader in mountains. - 1 Sherpa potter for 2 trekkers in a mountain. 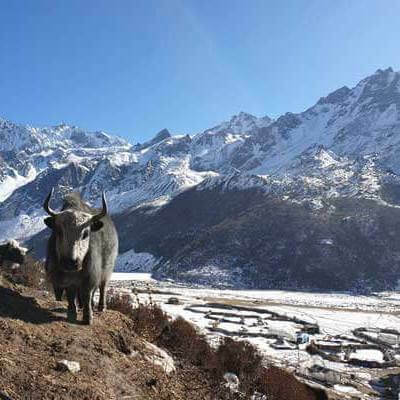 - Best Lodge Accommodations Mountain, all meals during trekking, all necessary staff with an experienced leader (guide) and Sherpa porters to carry luggage (2 trekkers: 1 porter) including their salary, insurance, equipment, flight, food, and lodging. - All the applicable services charges, government taxes, all necessary paperwork and permits (Annapurna Conservations Area permit, TIMS Card). - Arrangement of Emergency Helicopter service which will be paid by your Travel insurance company. -Good Vibe Adventure offers you Farewell Dinner on last night. -Nepal Visa fee (bring accurate USD cash and two passport photographs). -Entry fees for city sightseeing. - Travel and rescue insurance (necessary). -Lunch and Dinner while you are in Kathmandu & Pokhara city. - Personal expenses (phone calls, internet, laundry, bar bills, bottle or boiled water & Hot Drinks Tea and Coffee, Hot Shower, Batteries charge, Heater during the Trek and Sweet things like desert). - Extra night accommodation and meals if early departure from the mountain. -Tips for the guide, porter. (Tipping is voluntary).